The best shoulder holster is the one that works for you when you have specific use cases that can necessitate using a shoulder holster. It’s important to note that shoulder holsters aren’t made for everyone. They are a very niche product in the market for those that can truly benefit from the unique use case that they cater to. Our goal with this article is not simply to review the best 8 shoulder holsters in the market, but also to help you determine if a shoulder holster is actually the right fit for you and your normal day to day carry. It’s more important to identify what type of holster makes sense for you, than it is to find a great holster. More of your comfort, draw capability and general satisfaction will come from the style of holster you choose, than it will from the nuanced build of the competing holsters. The Holster industry is actually quite a polarized segment of the firearms accessory market. There are less than 100 legitimate shoulder holsters on the market, and when you throw into the mix, the concept of a “Best Shoulder Holster” you really end up with less than 20 that are actual contenders. This article should guide you to the right holster if you determine that a shoulder holster really is a good fit for you. 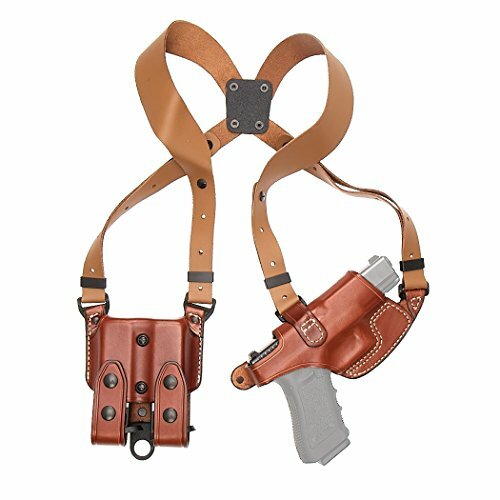 Who Should choose a shoulder holster over other holsters? Who should probably NOT choose a shoulder holster? Plainly: if you wear a shoulder holster routinely, no matter how diligent you are, trying to keep it concealed, you WILL NOT be able to. If you are an employee at a large company in an area that has a lot of traffic or a lot of exposure (i.e. you do not have a separate office area) you will likely not be a good candidate for a shoulder holster. The hassle of having to explain your politics or your decision to carry, and also defray safety concerns by other employees, means the logistical nightmare of carrying, even if you do have permission to carry at your work will be very annoying. PLEASE NOTE: carrying a firearm to a public workspace could be grounds for termination by most companies and may cause other issues with people worrying and calling law enforcement or other regulatory agencies on you for having a firearm. Forgetting that you are carrying (at a school or a bank or a courthouse) can be dangerous, illegal, or at minimum a hassle, so make sure you are aware of what you are doing when it comes to public facing scenarios with any holster but especially with one as easy to discover as a shoulder holster. If you carry a smaller or flatter than average firearm, the horizontal carry is an excellent choice. 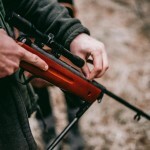 If you are carrying a large gun or a long-barreled revolver, the vertical options will be best. 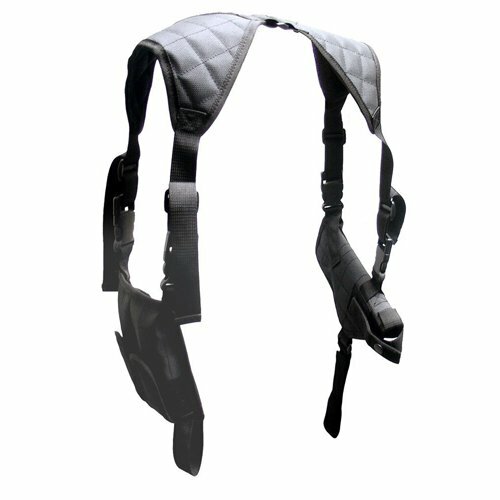 If you need a dedicated quick deployment system for private protection details or specific work that will require the fastest access to a firearm, especially something like a SMG (sub machinegun) or a carbine, get a single point sling that can hang freely under a jacket or whatever duty gear you will need to accommodate with a sling. If you sweat a lot you should either sweat a bunch with your new leather holster over a sacrificial t-shirt to get residual tanning dyes out of the leather before you wear it in work attire, OR you should opt for a cloth/fabric holster type. 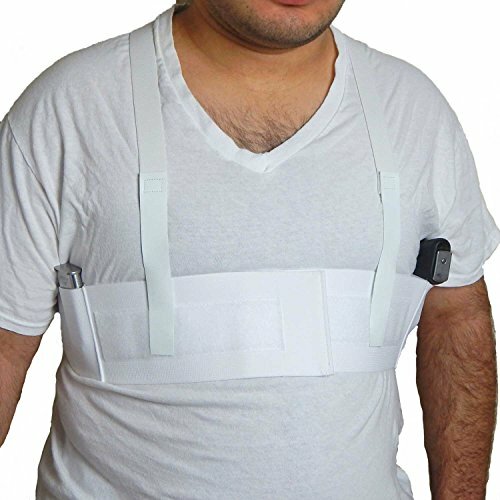 Get ready to purchase some extra clothes when you determine you need to use a shoulder harness, because even if you have a wardrobe you like, you will be shocked at how much difficulty a shoulder holster can inject into wearing fitted clothing. You’d also be surprised how much you will dislike how certain things look when you wear them with a shoulder holster. You will generally want to wear jackets if you are public facing, and note, as mentioned above: no matter how hard you try a vast majority of the people you come in contact with on a regular basis WILL NOW KNOW you carry a firearm, as concealment in movement is not the shoulder holster’s best performing feature. Super comfortable wide shoulder straps make the Gould & Goodrich a very nice option. The gorgeous leatherwork and company reputation are also very compelling reasons to look at this shoulder holster. This is a premium mainstream option. 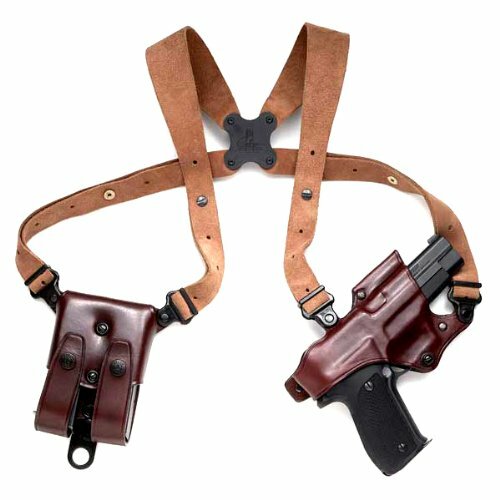 You get custom-like features for a rig that costs about half what a custom leather shoulder holster rig will cost. This is a premium choice for those who want top quality build without having to move into a custom. For off-the-shelf, this is one of the top choices. WHY IT IS RECOMMENDED: Seriously good craftmanship and superior comfort as a result of the cut of the straps and the drape of the leather. The Condor Vertical Shoulder Holster is the choice for those who only occasionally need a holster or who are carrying a smaller firearm that doesn’t need significant weight holding capability in a holster. That said, it is capable of being used for anything that any other shoulder holster can be, but it is a better holster for dabblers, or those who are new to carrying on a shoulder rig. WHY IT IS RECOMMENDED: Some people will still not be sure if a shoulder holster is right for their situation. Even after reading this entire article, the Condor Vertical Shoulder Holster is a good choice for finding out if it’s for you and having a good option for times when a shoulder holster makes sense if that is not full time for you. The Deluxe Universal Horizontal Shoulder Holster is a great choice for those who need to remain active all day while carrying a holster, but don’t need the type of support that a leather holster can give. It is also a holster that can justifiably be replaced over time as it wears out due to hard use. For those that need to wear tighter fitting clothing might find better utility out of this than other options on the list. 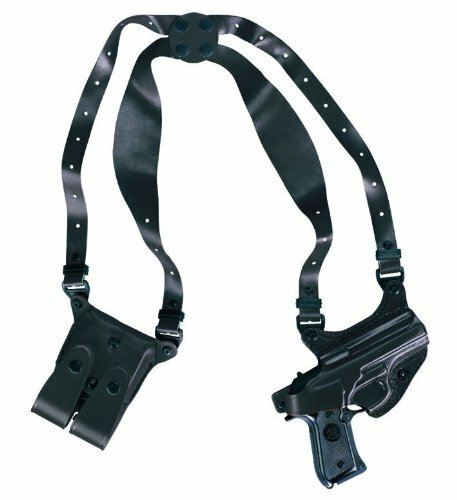 WHY IT IS RECOMMENDED: The Deluxe Universal Horizontal Shoulder Holster wears well for a fabric holster rig. It is also very well built for the money. Premium Center Cut Steerhide leather harness with four independently pivoting straps. Glock 17, 19, 22, 23, 26, 27, 31, 32, 33, 34, 35, 36. Accepts tie downs, cuff case and accessory attachments. Comfortable medium-width harness with swiveling Flexalon backplate. 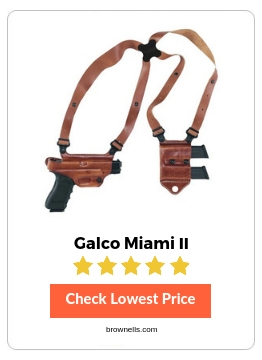 Galco Classic Lite Shoulder Holster is a great choice for those who want a leather holster but don’t want to spend above $100 and for those that need a bit less of a feature set from their holster or still need a light overall weight. This is an obvious choice for those who need very lightweight carry weight but also a robust build quality. 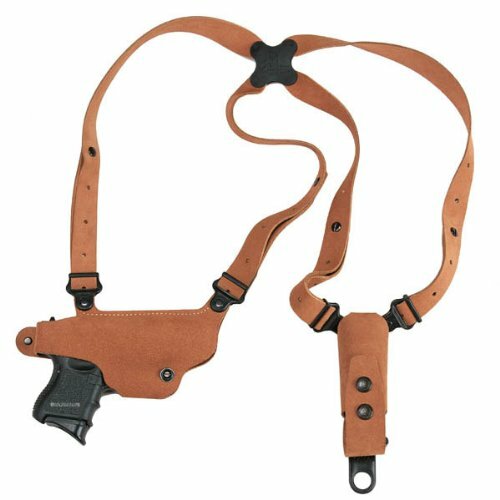 WHY IT IS RECOMMENDED: The Galco Classic Lite Shoulder Holster is a good price of entry into the solid leather shoulder holster market. The Aker Holster is one of the more comfortable shoulder holsters in the market. The serious attention to design detail makes this a fantastic choice for those who need the best comfort and can handle a slightly less robust overall build quality (the leather isn’t as thick as some other options and the design is not as complex). It wears very well for most users and the concealability can be very high if the right clothes are worn. The design and build quality are excellent if not quite at the level of the top tier makers. The price point makes this a relative bargain though, all things considered. 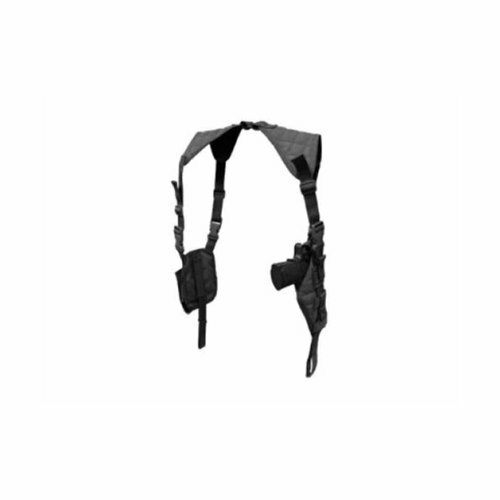 WHY IT IS RECOMMENDED: A top choice for anyone who knows for sure that a shoulder holster is for them. This may be the best sitting-to-standing holster on the market, and therefore one of the best car or corporate office setting holsters on the market as well. 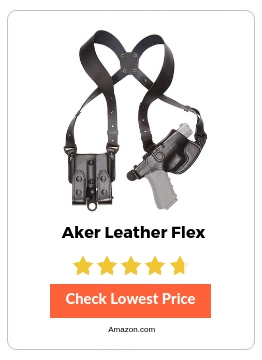 The Aker Holster easily has the best balance of features, capability and comfort of any on the market, considering the price point. MADE IN THE USA. This holster is a Quality product. Lifetime Guarantee. Our shoulder holster will conceal your gun without the need to wear a suit or jacket! The DeepConcealment Shoulder Holster is a very good option for those who need to carry a gun and have ultimate concealability for a shoulder holster type rig, but also can sacrifice some quick access for the extra concealability. This is not a good fit for very heavy guns, it is best suited to smaller guns (e.g. the Walther PPK or substantially similar). It is not a super well-made product by virtue of the materials, and while it will last you if you treat it right, it is not a life-long carry partner like the others on this list. This is a very good holster option for those who cannot wear a jacket, or must wear sportier clothing, or for those with back problems. The weight distribution is good with the properly sized guns it will accommodate. WHY IT IS RECOMMENDED: The DeepConcealment Shoulder Holsteris simple. It is relatively inexpensive. It is the best carrying experience for under the shirt carrying. It is also very easy to run in and will support small and medium guns very well. A great throwback that still has modern applicability. The Galco Jackass Rig Shoulder System is one of the original designs that ended up shaping the entire industry. It has roots traceable to 1970. The design is timeless for those who understand what a good candidate for a shoulder holster is. The leather quality is great, and while it isn’t fully custom, the leatherwork and the styling are very custom-like when it comes to movement and load balancing. The more diagonal holster position makes it the de-facto standard for sitting-to-standing holsters in the shoulder holster market. This is a great choice for those who know they don’t have a problem showing off their hardware but need something that fits like a glove anyways. 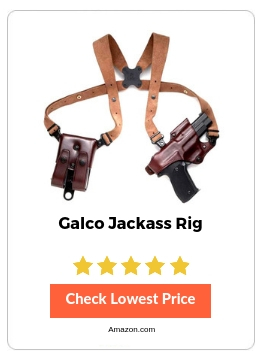 WHY IT IS RECOMMENDED: the name brand, the quality of leather, the Galco Jackass Rig Shoulder System is the original design that is still obviously applicable even though it debuted in 1970. The Miami Classic II is the original shoulder holster, that is likely to have started it all (the hype that is). This is the type of holster you began seeing in TV shows in the 1970’s and 1980’s that showed off the cool, seamless flexibility of the shoulder holster for slick, smooth talking agents and cops. It’s called the Miami Classic (II) for a reason. Even if they are the ones that popularized it (the TV stars), this is on the market still, because is just works, and very well at that. This looks the part, but it fits the bill from a performance perspective as well. For many years this was one of about 4-5 holsters on the market for the shoulder holster users. WHY IT IS RECOMMENDED: Galco practically invented this market segment and a lot of credit goes to them for popularizing this concept for the masses. It’s built like a tank and will last a lifetime and be comfortable the entire time. When looking for the best shoulder holster, there are not a ton of options to choose from. It is a very small niche market and most of the items on the market are very much to one side of the economic scale or the other, there is not a good balance across the entire spectrum of the offerings available to the consumer: you either pay for a low-priced holster or you pay for a high priced holster. It is either cloth or it is leather. Therefore, the most important thing you can do is look at the actual use case you have, and then walk through the bullet point items touched on above, to see where you fit in on the spectrum of shoulder holster users. In the end we are sure you will be able to find the one that fits your needs perfectly, of course, assuming you are a legitimate candidate for using one. Shoulder holsters are an important tactical item for those who like concealed carry.There aren’t a heap of options available so we have compiled a list of the best designs and models.